Ya that's not it. That one puts all six into one. This one is a dual exhaust. This is odd. The headers they have posted on their website are shortys. Looks like I'm going to have to give them a call and sort this out. ps. Here is the web link I was looking at. Its really hard to photo this. very happy with it however. simple easy modifications were done. Looks good kicker - thanks for the pics. So now you will have a 2 stroker eagle family !! Problem is hers should be faster. she has 3.08's i have 2.73's. however mine is manual sr4 hers the auto a998. Forgot to mention the down pipe. have no idea where it came from. most likely an aerostar with an aw4. I give the sr4 hel l offroad and on.it performs perfectly. i understand the shifter problem and i have no problems. 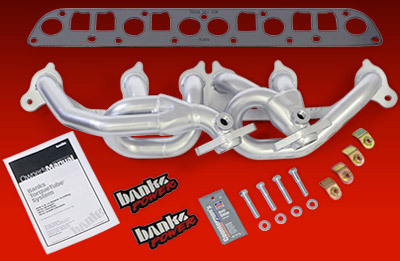 If someone wants to experiment with the clifford dual exhaust headers I have a set I don't plan on using. If I did use them I would use them in a CJ. They are new in the box. They came with one of the cars I purchased. I'm thinking about doing this for at least my wagon and wondering if there is a noticeable gain in mpg? Found ANOTHER dual exhaust setup! If your having clearance issues then this one will most def work!